Judy Rafat, Canadian protegé and friend of the world famous bebop trumpeter Dizzy Gillespie, is undoubtedly one of the best jazz singers of our time. Judy offers enthusiastic listeners a colourful fireworks of bossa nova, swing, latin, blues and, of course, bebop. She posesses a voice truly unique in its combination of intimacy and strength, enabling a range of expression that has touched the hearts and souls of her fans the world over. Judy Rafat grew up in a musical family and began singing at an early age. After graduating from the University of Western Ontario with a degree in music, she toured Europe before settling in Germany and embarking on a career as a folk singer. For her artistry and social commitment, she received a great deal of attention and many accolades in all areas of the media. 1986 brought a turning point in her career with the discovery of her love for a very special direction in music, namely jazz. Her love for this genre was sparked in New York in an unforgettable meeting with Dizzy Gilespie, one of the most important and greatest jazz musicians of all time. It was Dizzy Gillespie who, together with Charlie Parker, was the creator of bebop, a new revolutionary direction in the history of jazz. Judy and Dizzy became close friends and remained so until his death in 1993. Judy’s fruitful cooperation with Dizzy began in 1989, when she was asked to perform with her quintet as Dizzy’s opening act for concerts in East Berlin, Moscow and Prague. This was followed by tours through Poland, Bulgaria, Rumania, Russia, Lithuania, Italy, Germany, France, the Netherlands, Belgium and Switzerland. In 1994 she was appointed as an instructor in vocal jazz at the Mercator University in Duisburg. Shortly thereafter, she began intstructing the fine art of jazz singing to enthusiastic students at the University of Essen. 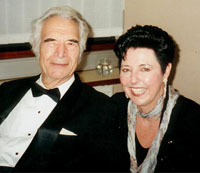 The year 1996 brought Judy public acclaim once again through appearances together with the Dave Brubeck Quintet. She had now achieved her breakthrough and was in demand worldwide. The secret of her success lies in her ability to appeal to a wide audience with a varied repertoire and a dynamic stage presence. She has been described by critics as a strong improviser, with a voice powerful enough to soar over any combo or big band. Her choice of repertoire shows that she wants to convey a special message to her listeners. For example, with the piece “Brother K – a Tribute to Martin Luther King” by Dizzy Gillespie. Judy’s inimitable style and expressive artistry give her the means to reach out and truly move her audience. In 1997, she waas invited by Jon Faddis, to perform with a star studded ensemble in Englewood, New York at the 80th Birthday Celebration of Dizzy Gillespie. This was followed in 1999 by a further climax in her musical development with the release of her CD “CON ALMA”, a tribute to Dizzy Gilespie. This album is devoted solely to the compositions of Dizzy Gillespie. “Con Alma” represents a milestone in Judy’s career and is an impressive expression of her exceptional artistry. Judy Rafat has sung to the enthusiastic reception of discerning audiences in the world’s best hotels. Especially noteworthy: her long engagements in China in 1999 and 2000, where she dazzled audiences in six month engagements in both the Ritz-Carlton Hotel in Shanghai – e.g. with Wynton Marsalis – and “The Big Easy” in Peking. In the same year, 1999, Judy was approached by the German Ministry for the Environment with a request to produce a special CD for the initiative “Women and Agenda 21”. She gladly accepted, composing the title-song, “women of the world”, and several other pieces of her own. The success of this CD further underscored her great versatility. Since 2000, Judy Rafat has devoted herself extensively to pedagogical activities. She founded her own “School of Vocal Music” where she can pursue one of her most heartfelt desires: to pass on to her students that which she herself has learned in the course of a long and varied career. In 2001 a close and fruitful collaboration with Thomas Rückert began that has developed into an intensive musical experience. Likewise the founding of her quintet(2003) with Olaf Polziehn (Piano), Henning Gailing (Bass), Hendrik Smock (drums) and Lothar van Staa (Saxophone). With this team she recorded the album “Pure Inspiration“ in 2005, which was followed by numerous performances throughout Europe. Judy received a great deal of recognition in 2006 during her “A Tribute to Dizzy Gillespie” tour. She is the only jazz singer in the world with a program exclusively devoted to the works of the great master who was her mentor and friend. In the same year she appeared in front of an international audience as part of a six-month engagement at the Shangrila Hotel in Singapore, as well as the local jazz club Southbridge.